In recent years, I have been a guest speaker all over my home state of Virginia. This started when the National D-Day Memorial (located in my home town, Bedford) approached me about putting together a lecture for their winter series. I have been a volunteer at the Memorial for a number of years, most often appearing in period dress for their various Living History events. They know my knowledge of and passion for Old Hollywood, and they asked me to create a presentation on the topic. Thus, my lecture Hollywood Goes to War: Screen Queens and the War Effort was born. I profiled a handful of my favorite actresses, Jeanette MacDonald being chief among them, naturally, and explained their contributions to their country during WWII. I accompanied my lecture with film clips and pictures on a projection screen, as well as taking items from my personal collection (such as a pair of Joan Crawford’s shoes) for people to see and enjoy. I was approached after my first lecture by several other people, and to date I have “played” every retirement home in the surrounding area, ladies’ groups, Veterans’ Associations, and other similar organizations. I always do a Q&A session after my lecture concludes, and try to stick around afterward to mingle and talk to members of the Greatest Generation. Jeanette always garners a huge reaction everywhere I “take” her. My only explanation for this is that Katharine Hepburn and Joan Crawford and other actresses are still thought of today, more than Jeanette, and their movies are comparatively easier to find in stores and on TV. When older people see Jeanette, or, more to the point, Jeanette and Nelson together, they react with total joy, as if they are greeting a long-lost friend. That, to me, magnifies the importance of what we are doing in the MacEddy Club. These people were so beloved in their day and deserve to be right there at the forefront of our memories with Hepburn, Bogart, Garland, etc—but they won’t be unless we all take an active part in keeping their memories alive. I have had a few very meaningful MacEddy-related encounters in my travels with this lecture, and while they are not concrete proof of anything, nor would my writing hold up in a court of law, I feel that these happenings are worth reporting because, at the very least, they are interesting. Firstly, I was approached after my lecture one time by a very old gentleman whose opening line was, “MacDonald was exceptional. I got to meet her.” After I had picked my jaw up off the floor and hurried into his personal space, I asked for details. “I met her after one of her concerts for Army Relief. Some of my buddies and I went to see her, and she was magnificent—and gorgeous to look at. The screen doesn’t do her justice.” I said that I was sure that was true and, as a matter of fact, it had been said about her before. 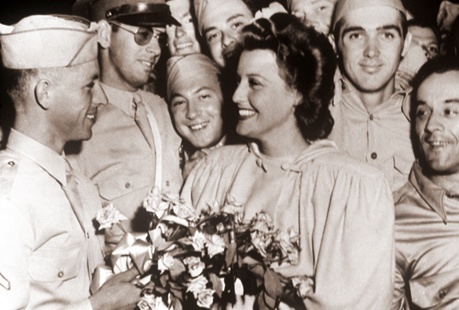 He went on to say that Jeanette, clearly tired after her concert, stayed in the hall until she had individually shaken the hand or kissed the cheek or signed the program of every single person in uniform who wanted to meet her. He added that as he and his friends grew closer to her, she took her shoes off, laughing that she was tired and would be more comfortable in her bare feet, if they didn’t mind. They didn’t! How like that sweet Jeanette—always so kind to her fans, and so loyal to those in uniform. My second eyewitness story is more compelling. A woman at Westminster Canterbury, one of the classiest retirement communities in the area (where I have been asked to lecture more than once!) told me about growing up in the Philadelphia area. She was an avid Nelson fan and saw him in concert every time he was remotely local. As I was mingling with the group after my presentation, she approached me and asked if I had any idea if Jeanette MacDonald ever accompanied Nelson on his tours. I said yes, that we have had people come forward and say that she was there some of the time, on the road with Nelson or meeting up with him at a particular stop. A look of sly vindication crossed her features and she said, “Oh, I thought so!” When I asked her why, she said she had seen Nelson give a concert in Philadelphia “back in the Forties” and the weather was cold and miserable. Because of this, only a few people went to the stage door that night, and actually, when Nelson emerged, he told them all to go home before they caught cold! She remembers a woman, whom she described as “very willowy and slender” wearing slacks and a trench coat, with a scarf over her…wait for it….bright red hair. This woman, with her head down, walked purposefully from the stage door to the waiting car. Before she had reached the car, a voice from back inside yelled, “Jenny! Your purse!” upon which the redhead wheeled around, exclaiming, “Where have I parked my brain tonight?” and trotted back after her purse. She got into the car, and when Nelson came out, he got into the same car. The woman I talked to pointed out that she must have been backstage the whole time because, “She wasn’t dressed up enough to have been out front.” She said, “My friend and I always felt sure that was Jeanette MacDonald. There were rumors that they loved each other.” ……Recounting this now, all I can do is smile. The last anecdote is possibly the most touching, though it is vastly different from the other two. One of my lectures was at the Guggenheimer Nursing Home in Lynchburg, and I had never been there before. Nobody told me (and I, at this point in my experience, was not savvy enough to ask) that the residents there were extremely, to use their term, “low-functioning”. This means there were many people there with Alzheimer’s and dementia, nearly everyone was wheelchair-bound and more than a few of these people didn’t seem to know I was there. My lecture is full of facts and history and statistics, and I knew at once that this wouldn’t do for this group. To give them the most enjoyment, I needed to simplify. I decided to skip the lecture and show pictures and videos and play music that would be familiar to them, and lo and behold, that ended up making a lot of people happy that afternoon. One woman was wheeled in about ten minutes after I had started. The nurse parked her chair very close to me, the only space that was left, and she touched my arm. “She won’t even know she’s here,” she told me. “She hasn’t said a word ever since she was moved in. Sometimes she responds to music, but she doesn’t talk.” I nodded and continued with what I was doing. Several of the residents enjoyed the Andrews Sisters, and a few smiled and pointed at the screen when I showed Fred and Ginger. When I got to Jeanette and Nelson, I decided to show Will You Remember from Maytime. Just as they were getting into the song, the wildest thing happened. From the chair parked so close to me, there was motion. The tiny, frail woman in the chair lifted her head. She never opened her eyes, but in the smallest voice, she sang “Ah, love is so sweet in the spring….time…..when blossoms are fragrant in May…..” Well, I was teary in about two seconds, as was the nurse. The whole way home that day, and every time I’ve thought of it since, I’ve been forced to marvel at the power of those two beautiful voices and the way they touch people. That woman hadn’t said a word in months. She wasn’t responding to anyone around her, but somewhere, deep inside, the magic of Jeanette and Nelson touched her. On some level, she knew them, and for a few moments, she was alive again. It was a moment I will never forget. There is so much drama surrounding these two amazing people—even fifty years after their deaths. I’m not going to say we need to bury the hatchet and all be buddies, because I am realistic, but I do ask this of everyone who loves them: DO NOT LET THEM BE FORGOTTEN. They deserve our best, for all the years they gave us their best. Hi, I’m writing for my cousin Mary Anspach…. She’s referring to the conversation with you at the recent Jeanette MacDonald/Nelson Eddy Club Meeting at the Sportsman Lodge in Studio City. She wants to let you know that she talked with her sister and Phyllis verified that they were ages 4 and 5 years old. They were at the Pier in Santa Monica in the summer of 1935 or 1936. Her sister, Phyllis, remembers that Nelson came to them when he heard Mary crying (she caught her finger in the car door) and took them (with their mother and Aunt Mary Surina, a dress designer) to, they think, his house. He dressed the wound and then walked them to their car.